WELCOME to Kid-Lit INDIA - a place to find reviews of children's books published in India and other news and write-ups from the Indian kid-lit scene. I was at Higginbothams, Chennai, browsing the children's section for books by Indian writers when I stumbled upon this amusing read. The author's name drew my attention to this book. In the past I have read a couple of other good reads by her - "Mrs. Woolly's Funny Sweaters" and "The Mystery of the Secret Hair Oil Formula". Asha Nehemiah has written several other wonderful books that I look forward to laying my hands on. 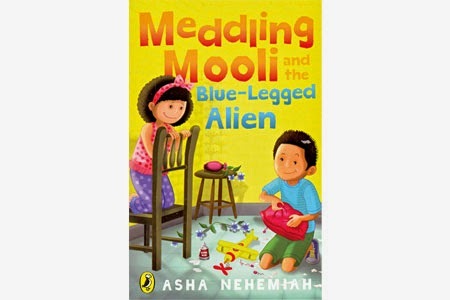 But for now here is her first book from the Meddling Mooli series. Mooli (Murali) and Soups (Supriya) are best friends. They follow a website called WAYOUTS (World's As Yet Original Untried Tricks and Stunts) and try to do some tricks of their own. But this means chaos and trouble for the grown-ups! Mooli's mother's kitchen is a mess, her list is gone and so is her electric beater. How can she be filmed making her special cookies without her things? To win a prize on WAYOUTS, Mooli and Soups make a list of possible 'original' tricks. One such trick is for a blindfolded Mooli to shoot a suction arrow on a spinning globe while calling out the name of the country it would land on. But can anyone be successful without failing a few times? The arrows land everywhere, but on the globe - on Mrs.Mehta's dog, on a tree, a vacant balcony and even Mr.Reddy's forehead! Worst of all, Mr.Reddy thinks the flowers from his garden are being stolen by Mooli and Soups! In their bid to prove themselves innocent, the two give Mr.Reddy a demo of how bad Mooli's aim is. But instead Mooli's arrow makes it to the globe on the exact country he called out, much to their own surprise! Now all the kids must do is write to WAYOUTS about their success, along with a testimony from a witness. And their only witness is Mr. Reddy! But considering he still thinks they are the flower thieves, will he agree to give them a witness letter? Will Mooli and Soups win a prize on WAYOUTS? What do the Best Garden Competition, a video camera, a blue-legged alien, a toy remote-controlled airplane have anything to do with the rest of the story? You can find out only if you read the book!! This book is appropriate for 7+. I liked this book because it is easy to read and has apt illustrations that go with the hilarious situations the characters find themselves in. The story not only entertains, but also encourages children to try out new things, be responsible, accept disappointments and not give up.